Caltech astronomers are using Pegasus to generate science-grade mosaics of the sky (Montage project http://montage.ipac.caltech.edu/). Montage delivers science-grade mosaics of the sky. Our technologies were used to transform a single-processor Montage code into a complex workflow and parallelized computations to process larger-scale images. Montage workflows mapped by Pegasus to the NSF CyberInfrastructure are characterized by tens of thousands of executable tasks and the processing of thousands of images. The image above (Beaton et al. 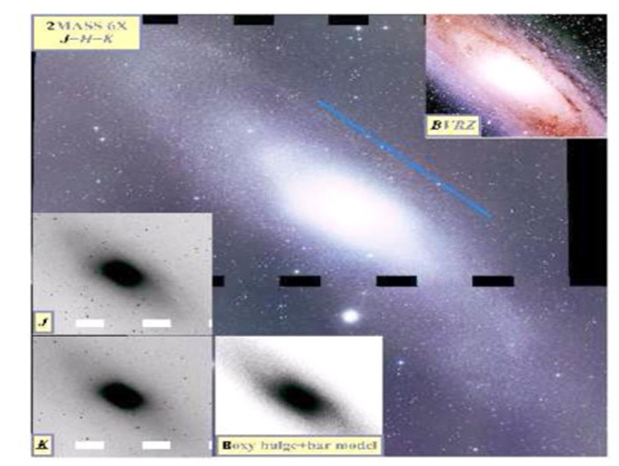 Ap J Lett in press) was recently created to verify a bar in the spiral galaxy M31. Eleven major projects and surveys worldwide, such as the Spitzer Space Telescope Legacy teams have integrated Montage and therefore Pegasus into their pipelines and processing environments to generate science and browse products for dissemination to the astronomy community. The Montage team needed the ability to deliver provenance records along with the mosaics so that the scientific value of the images could be ascertained. To support these capabilities, we interfaced Pegasus with the PASOA provenance store (url). We also developed a pipeline-centric provenance model.